BOSTON – UMass Boston women’s soccer rallied from an early deficit, to earn a 4-2 win over Framingham State University Tuesday evening at James Cotter Field. With the win UMass Boston’s Beacons are now 9-5-1 this season. With the loss, Framingham State falls to 4-9 overall. UMB Senior Jaclyn O’Grady scored twice and sophomore Lindsay Bouscaren added a late goal to lead the Beacons to their fourth-straight non-conference victory. 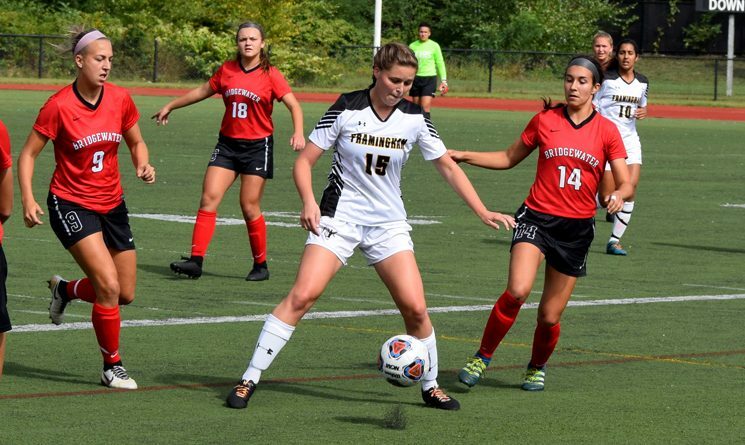 O’Grady tied the game in the 34th minute and the Beacons took the lead less than two minutes later on a Framingham State own goal. UMass Boston put the game away in the second half, as O’Grady and Bouscaren sandwiched goals around Framingham State’s lone second half tally. The Rams jumped on the Beacon early, as they scored off of their first opportunity of the game. Hannah Kane (pictured) sent a corner kick into the box and Casey Good headed it home while twisting her body away from goal. UMass Boston began to slowly find their way into the game and tied the game at 33:45. Freshman Allie Crawford led O’Grady in on goal and O’Grady flicked a shot over the goalie from 10-yards out. O’Grady pushed the Beacons lead to two at 53:01. Off of a Richards goal kick, O’Grady drove towards the top of the box, cut back and then sent a line drive goal into the top netting over the onrushing keeper. Framingham State made the game interesting when they cut the game to 3-2 at 67:45. Elizabeth Paolucci dished a pass to Camryn O’Leary and O’Leary sent a high arching ball towards goal from 25-yards out that snuck below the crossbar. UMass Boston put the game out of reach for good at 73:21. Freshman Grace Oliver found Cal Pitts in space and then Pitts found a wide-open Bouscaren at the top of the box. With Brown forced to come out of her net, Bouscaren toe-poked a shot past the Rams goalie for a 4-2 lead. In net, freshman Caroline Richards made eight saves on 10 shots to earn her second-consecutive win. Framingham State’s Madison Brown made four saves on eight shots to fall to 4-6 on the year. Rams defender Kaleigh Pallotta made a goal line clearance in the 88th minute to keep the score 4-2. The Rams return to action on Thursday October 18, when they travel to Becker College for a 4 p.m. game.